By Selin Tekin Guven and Sanjeedah Choudhury. On 14th June 2017, a fire broke out at the Grenfell Tower block in North Kensington, causing at least 71 deaths. The origin of the fire was accidental; however, the astonishing speed at which the fire spread was thought to be due to the building’s (flammable) cladding. The cladding was installed during a renovation, which was completed in 2016. A residents’ organisation, Grenfell Action Group, published a blog highlighting concerns about fire safety in their building. Sadly, their concerns were ignored by Kensington and Chelsea Tenant Management Organisation (KCTMO), who managed the tower for Kensington and Chelsea London Borough Council. 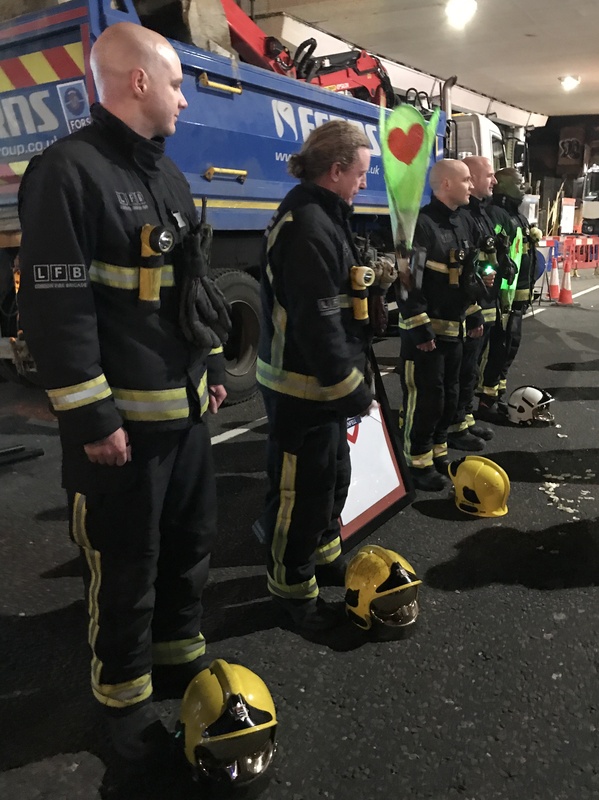 Firefighters show solidarity with protestors at the Grenfell silent march. Despite the tragic loss of life, no one has been held accountable for the disaster; survivors and other community members are still seeking justice. 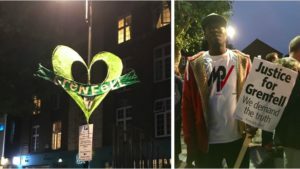 Protesters have been organising silent marches on the 14th of every month to ensure that the victims – and survivors – of the Grenfell Tower fire are not forgotten. A reason why a great many people join these marches – including people from hundreds of miles away – could be because they feel that they are in the same group as the survivors of Grenfell; they share a social identity. Research shows that during sudden and unpredictable events such as disasters, people unite through a sense of common fate. This unity and feeling of group-belongingness generates support for others in the same group because the ‘others’ become ‘us’. And although the fire happened in North Kensington, many people understand that “fire is an inequality issue”, with even a government-commissioned study showing clear relationships between rates of fire and poverty. As a result, tenants in low-income housing are more likely to face fire safety issues. It is no coincidence that this tragedy occurred in a tower block which mostly consists of social housing. A grassroots report on the Grenfell Tower fire shows how it was caused by austerity and gentrification. Even though the council is one of the wealthiest councils in the UK (with £274 million in the budget already), they did not use the appropriate fire-resistant cladding just to save £5,000; in addition, they did not install the sprinkler system, which only costs £200,000 while they were renovating the Grenfell Tower in 2015-2016. While the other buildings (such as Trellick Tower) have, apparently, the construction system to prevent fire from spreading to the other blocks, the buildings for social housing (in other words, affordable housing for the working class population) do not have the same opportunity. Although there are improvements for the survivors recently, campaigning is still important to prevent similar tragedies from happening. At the time of the fire, 14 of the 127 flats were leaseholder owned. Failed by the State will be shown at the University of Sussex on 21 February 2018, with a Q&A with the directors of the film. ‹ What happens after a disaster?